Through world-class, patient-focused care; innovative clinical and laboratory research; and specialized training, Department of Neuro Surgery at Capitol provides complete neuro-surgical expertise to patients; both clinical and surgical with cranial & spinal diseases and disorders. Our specialists offer an array of services including cerebro vascular, spinal, functional, traumatic, tumor, and pediatric neurosurgery. The Department of Neuro Surgery at Capitol is fully equipped to perform all types of surgeries for a wide range of illnesses. The management of brain tumors includes treating benign and malignant tumors. 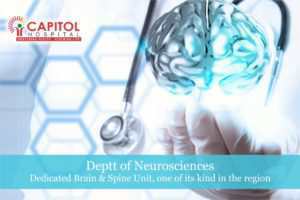 Capitol is one of the few hospitals in the region treating abnormalities of the blood vessels of the brain and spine. This includes aneurysms and vascular malformation of complex types. Age related and other degenerative conditions of the spine like disc prolapse, spondylolisthesis, complex craniovertebral junction anomalies and other conditions of the vertebral column like traumatic spine fractures are treated here regularly. In treatment options, we offer range from routine microdiscectomies to artificial disc replacement surgeries of the lumbar and cervical spine. Various spinal tumors including meningiomas, schwannomas, ependymomas, gliomas etc are treated using most advanced intra-operative monitoring modalities to give an optimal outcome and maximize functional recovery of the patient. Disorders like congenital hydrocephalus, spina bifida and tethered cord are treated . Congenital craniofacial anomalies are managed in conjunction with the specialists of maxillofacial surgery and plastic surgery. The neuro surgical trauma care attend to wide range of brain and complex spine trauma which usually need emergent surgical treatment.